Phillies general manager Ruben Amaro Jr. revealed that Cole Hamels dealt with shoulder soreness at the end of last season and again during an offseason throwing program. However, Amaro assured Jim Salisbury of CSNPhilly.com that Hamels is fine and the soreness was nothing out of the ordinary. "I’d be concerned if this was an issue, but we don’t view this as an issue at all," Amaro said. "We shut him down for a couple of weeks, but he’s fine now. He was being proactive more than anything else, which is good. We backed him off and slowed him down, but he’s back throwing now and doing fine. He’s had no complaints." 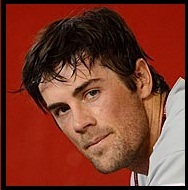 According to the report, Hamels contacted head athletic trainer Scott Sheridan in October and noted the soreness. Amaro said the issue was not serious enough to warrant an examination. The 29-year-old spent two-weeks on the disabled list in August of 2011 with shoulder inflammation and had surgery to remove a bone chip from his elbow prior to the 2012 season. Hamels signed a six-year, $144 million contract with the Phillies last July.